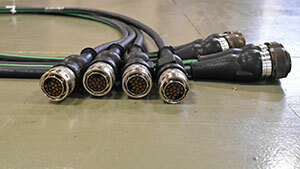 Flex-Cable is constantly working to engineer special cables and systems for motion control applications. These cables – both Flexing and Non-Flexing – and their systems make the interconnection of complex mechanical and electrical components simpler and reliable. With a product line ranging from the traditional flexing Servo, Extension and Box Mounting Cables – now available in a non-flexing cable – as well as Break Out Boards, Transition Cables, Fiber Optic Cables and I/O fanout Cables we are sure to have you covered.